It wasn't a new year resolution as such, it just happened to take place in early January. In the first week of the new year 2017 my registration for Women in Travel CIC finally came through. CIC stands for Community Interest Company; in practical terms, it means that it is a limited company with a (BIG) social aim. That to me makes all the difference and I hope also the impact. The answer to those who know me is very simple. I have a background in travel and tourism and over the last decade and a half I have worked tirelessly to support women, not just in travel but across other sectors. However travel (and tourism, hospitality and events by extension) remains the industry that is closest to my heart because that is where I started all those years ago. Some people don't see an issue with #gender and #diversity in travel and tourism, but I have spent the best part of 15 years proving otherwise. Women are very much attracted to the sector, I agree. But are they retained? Are they fully supported? Are they enabled to climb the ladder or even simply to maximise their contribution? Well, that's where our opinion may differ. Beside, there is the very important issue of entrepreneurship. You see, female entrepreneurship is touted around as the next big thing. But although it is the fastest growing area, in the UK women owned businesses only amount to 17/18% of all businesses. Surely we can do more and better - after all women are the ones who will keep the economy going in those difficult years according to some. I quote here Womanthology : 'research from McKinsey tells us that it’s women who are capable of driving economic growth, to the tune of, wait for it, $12 trillion if we only give them the chance. I want women to share in and contribute to the growth of the sector. I want them to benefit through entrepreneurship and through connecting, learning, mentoring and upskilling. 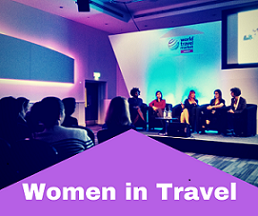 So this is my mission for Women in Travel CIC: Women in Travel aims to leverage a thriving global travel and tourism industry and its suppliers to provide women with the opportunity to fulfil their economic and individual potential through education, engagement and entrepreneurship. 2. Working in partnership with industry, governments and other interested parties, empower women to set up and grow their own travel and tourism business by undertaking projects aimed at reducing common barriers (such as access to funding) and acquiring practical skills. As for my vision: 1. To become a recognised catalyst for women empowerment in the travel and tourism sector. 2. To provide communities in key regions ( specifically UK, Middle East, Africa and Latin America with a sustainable livelihood by enabling women to become economically independent through entrepreneurship and a thriving career in the travel and tourism industry. I want to dream big because there is nothing stopping me. I know it will be a long journey but I hope many of you will join me. Please get in touch if you think you can help, if you have any ideas or any feedback to share. I want to thank you for your supplied information on this article. On the Beach is One of the most reputable travel agency in UK. We believe in clients satisfaction. You can contact us by calling on the beach customer service number. Are you looking for a reliable SEO service provider for your travel related site? Try the services of Bed and Breakfast today. I have used their services and my website ranking was increased. I see your site needs some unique articles. Writing manually is time consuming, but there is solution for this hard task. Discover the coast of Washington on a Luxury Yachts. Visit our website to check avability.